As a native of New Jersey, I am quite familiar with diners. After all, New Jersey would be better named “The Diner State” rather than “The Garden State.” And part of this blog’s namesake is reminiscent of a renowned diner food: taylor ham. So, when it came to visiting the Bowery Diner, I had high expectations. And, even though they don’t serve breakfast all day (and I didn’t try their coffee, which, by Jersey diner standards, has to be bottomless and perfect), the Bowery Diner lived up to my hopes. The one-page menu includes diner favorites, such as grilled cheese, burgers and chili, but also has an upscale element to it, with iceberg wedges, lobster pot pie and little neck clams present. To start, we ordered the artichoke dip, which came with triangles of pita bread. A layer of white cheddar cheese was baked on the top, and the creamy dip was rife with artichokes (as it should be). 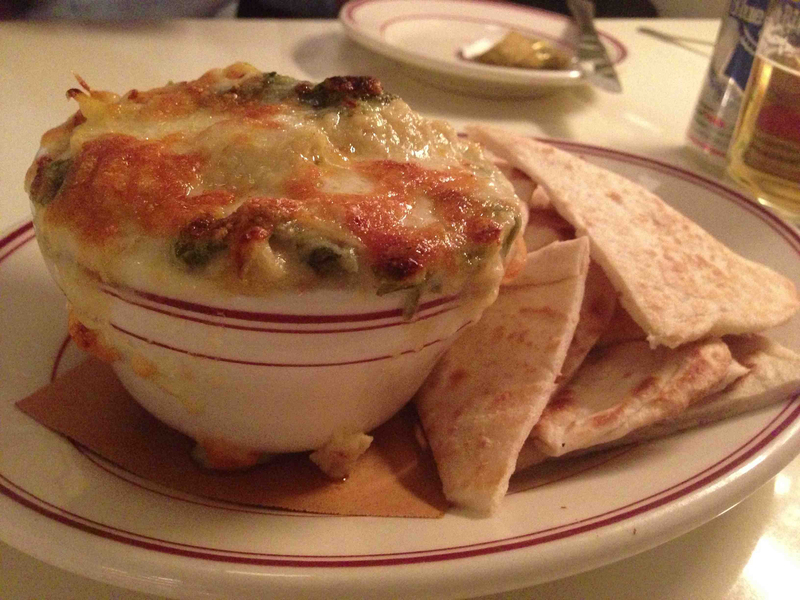 It also had traces of spinach, though, not enough to call it a spinach and artichoke dip. It was delicious. 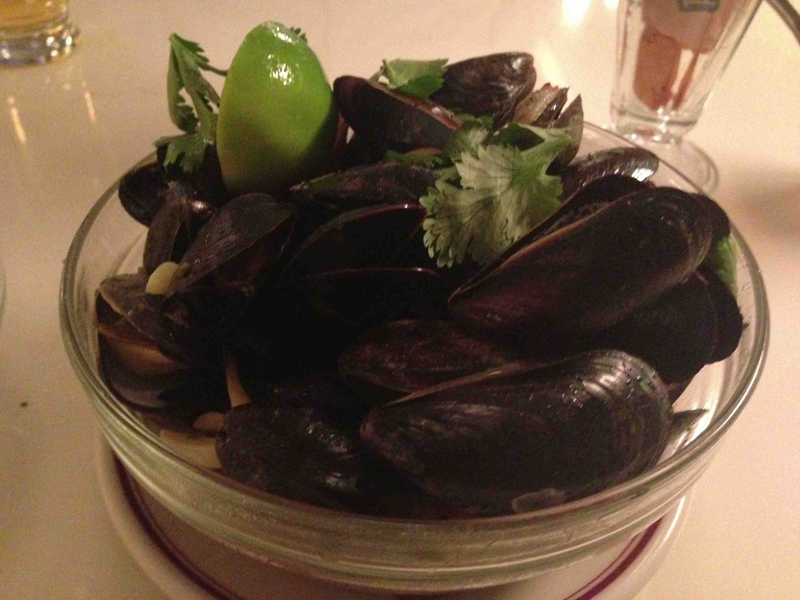 For my entree, I tried the mussels and fries, otherwise known as moules frites everywhere else you go in this city. The mussels were cooked in a beer sauce with smoked paprika. Slivers of chorizo dotted the mix. The mussels tasted fantastic, and were especially tasty once I go to the bottom of the bowl, where they had absorbed the delectable beer sauce. MDP got the fried chicken, which was flavorful and had a nice crust. It was accompanied by a slice of roasted squash and some nicely prepared collard greens. MDP also received an order of fries, but this wasn’t listed as part of the fried chicken dish on the menu, so I’m not sure that it’s standard to get fries with this dish. I enjoyed his meal greatly. Before going to the diner, I scoped out their menu and noted their scrumptious-sounding shakes: key lime pie, pumpkin cheesecake, seasonal pie. All of these shakes can be enhanced with a shot of liquor. 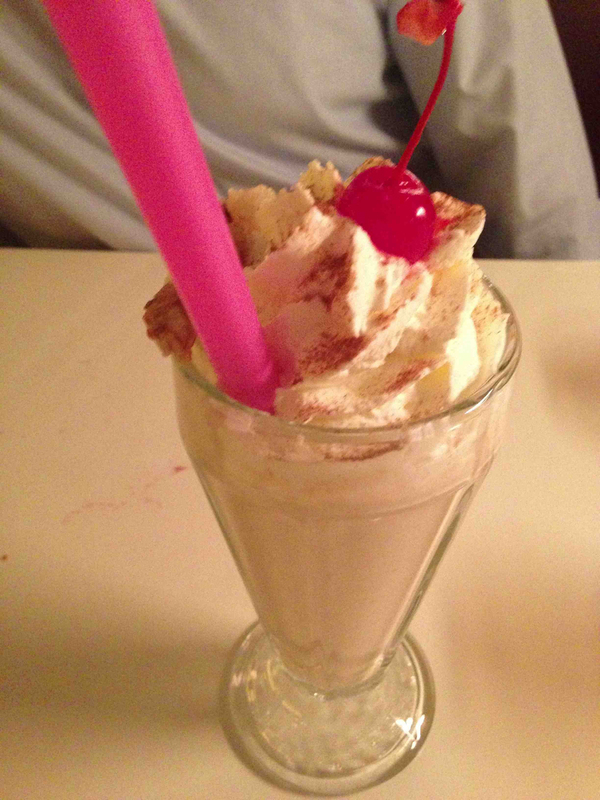 We chose the seasonal pie shake–which was made with apple pie, lucky us–and got a swirl of Maker’s Mark, which is among my favorite bourbons, mixed in. It was boozy and wonderful. I highly recommend. The service was very attentive and accommodating, and the place had a nice, 50’s-esque ambiance. I quite liked the Bowery Diner, and will be certain to try it again sometime when I’m in the neighborhood. The other good thing about the Bowery Diner is that it’s not overrun with hungry Manhattanites at 7 o’clock on a Saturday night. We had made a reservation, but it wasn’t necessary by any means. While it’s not technically a diner by New Jersey standards, I think the Bowery Diner certainly holds its own. In a way, it’s inventing a new genre of diners, and I like its innovation. Take the F to 2nd Avenue or the N/R to Prince Street.